Flickr shipped a massive update to their iPhone app just a few days ago. As an avid user of both Flickr and an iPhone, I wanted to share my thoughts about their new app and bit about the state of Flickr in general. In short, it’s a fantastic app sporting one of the best iOS 7 updates I’ve seen. It has many visual tie-ins with the also-recently-updated Flickr website. All in all, I am encouraged about the future of Flickr and their resolve to avoid obsolescence. There is a lot of Instagram-type inspiration going on, and I like it. When scrolling down the main timeline view you can double-tap on an image favorite it; all images in your main timeline view are shown as edge-to-edge squares even if the image itself is a different aspect ratio. The notifications screen that shows all the activity happening on your account (people who have liked your images, favorited them, and/or new followers) is also reminiscent of the Instagram notification screen. In the main photo stream timeline, when someone has uploaded several photos, you see them as a collage of 2 or 3. You can tap on one of the photos you see to bring that photo’s detail view, or you can tap the button to “view all photos” and you’re taken to a gallery-type view showing all the photos in that set. Virtually everything within the app is tappable as a link, which is great. It’s very easy to find and explore new photos and photographers, and thus it’s easy to drill down deep within the app. Alas, there is no shortcut to get back to any of the top level tabs of the app. Suppose you tap on someone’s photo, then go to their profile timeline page, then tap onto another photo in their timeline, tap onto the comments of that photo, and then tap onto the someone who left a comment to view their profile timeline. Well, now you’re 5 layers deep into the app and it will take 5 taps to get back to the top. And, to add some lemon juice, to exit out of an individual photo view, you have to tap the “x” that’s in the top-right corner of the screen, but to go back a level when you’re on someone’s profile page, you have to tap the back arrow that is on the top-left of the screen. Moreover, since the Flickr app doesn’t have any gestural-based navigation (you can’t swipe from left-to-right to go back), the only way to navigate out of someone’s profile photo stream view is to scroll to the top to reveal the back button. Overall, the app is extremely well designed and easy to navigate and figure out. The nature of the design and content encourage (in a good way) getting lost in the app and discovering photos and photographers. Just an easier way to get back to the trail head is all I’m asking for. The pull-to-refresh animation is quite clever. If you’re at the top of the main timeline view, pulling down reveals a white dot. As you continue to pull down to refresh, the white dot gradually turns pink as it simultaneously gets surrounded by a thick blue line (the two colors of the Flick logo). Then the blue line and pink dot separate to form the the two-dot Flickr logo and they sort of spin/orbit around one another. This animation is even cooler when you pull to refresh from someone’s profile page. The blue line forms around the person’s circle avatar, and those two dots orbit around one another as the page refreshes and then the avatar sort of slingshots back up to where it was. The Flickr app can auto-upload your iPhone photos just like Dropbox does. So far as I can tell, once you’ve enabled the app’s auto-uploading feature, only your preceding photographs (and screenshots) will be uploaded to Flickr. It won’t begin uploading your whole iPhone Camera Roll. All your auto-uploaded photos are automatically set to private. This is, in fact, a setting that you cannot change. I like that it’s a non-adjustable setting because it means nobody will accidentally set all their uploads to be public. Photos that are set to private won’t show up in any public timelines and they are hidden from anyone who views your Flickr profile. You, however, will see the photos the same way all other photos appear in your timeline, and you can set any image to be public if you wish. Within the iPhone app, photos that are set to private have a little lock icon in their top-left corner. On the Flickr website, the only way to know if a photo is set to private or not is by going to the image’s permalink page where you can see a lock icon. 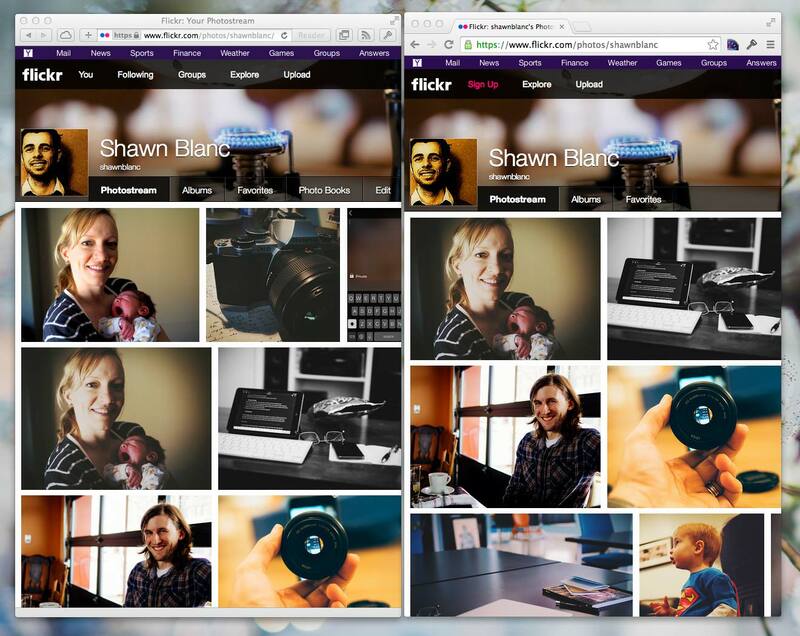 On the left is what my Flickr photo stream looks like to me, and on the right is what it looks like to others. p.s. Here’s what it looks like in a web browser. You can also share the upload to Twitter, Facebook, and/or Tumblr. As well as adding the photo to a location (via the Foursquare API), and adding to any of your Flickr Albums (or create a new Album). Flickr gives you 1TB (!) of free photo storage, which is pretty amazing. For one I’m not sure if I want all my iPhone photos to be in my Flickr account. The past couple years I’ve been only putting my best / favorite photos up to Flickr. There are a lot of silly, blurry, goofy images on my iPhone’s camera roll. Secondly, not counting the iPhone app, there’s no automatic uploading of my photos to Flickr. I have to manually upload my images. And, suppose I were to upload today all my photos from 2013 — they would appear at the top of my Flickr timeline, because Flickr doesn’t auto-sort by original photo date. While there are some cool possibilities with using Flickr as a hub for photo sharing and syncing, it’s still not there yet. The Flickr app continues to let you take and edit photos as well. Below is an image of my wife, Anna, holding our new nephew, Simon. The image itself was shot with my E-M10. In clockwise starting with the top-left image: (1) the original out-of-camera JPG; (2) a version edited with the new Flickr app using the Brooklyn filter; (3) edited on the iPhone VSCO Cam app using the F2 filter; and (4) a version edited in Lightroom on my Mac using the VSCO Film 05, Agfa Vista 100 preset. I tried to pick the filter in each app that I liked best for this photograph. Here, comparing them side-by-side here, the Flickr version looks the most dramatic and “cheesy”. 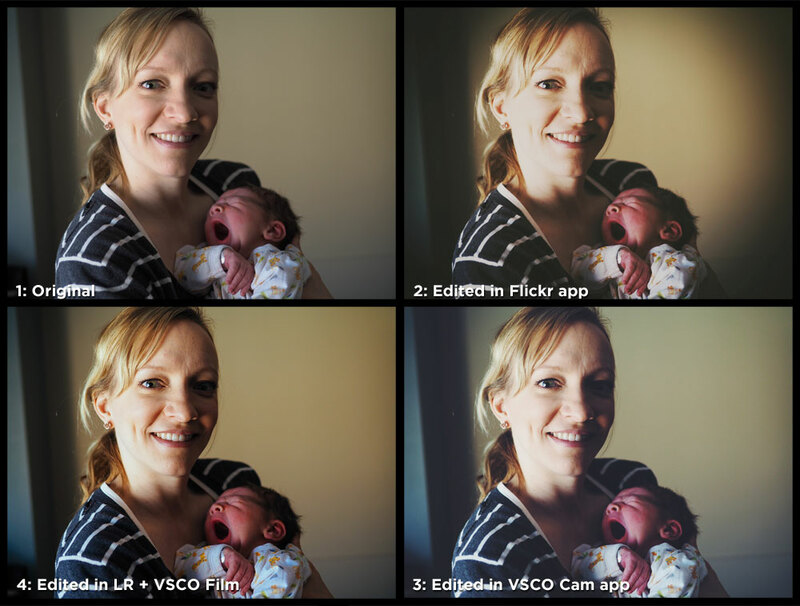 I think the VSCO Film version looks the most natural and nice. The VSCO Cam version looks great as well, though it too — for a one-tap filter application on an iPhone, I’m impressed. For a few days, if you installed the Flickr iPhone app onto your iPad you got a watermelon icon. Apparently it was an easter egg placed there by Flickr as a hint that the iPad app is coming soon. When you’re in the detail view of a photograph, you can “toss it around” just like you can with Tweetbot 3 for iPhone. This is a neat and fun touch. However, it’s also the only way to exit the detail view aside from tapping the “x” in the upper-right corner. When you tap a photo, it brings up that image in full-view. Tap it again and all the text and photo info on the screen disappears, giving you the “lightbox” mode. Tap in lightbox mode to go back to image-only view with the relevant text again. When leaving a comment, there is no way to reply to a particular person’s comment. You can only type your comment out, but not have it be an “@reply”. The new Flickr app is one of the nicest iOS 7 apps I’ve seen. Its links and tappable areas are clear, it does a great job using blur effects, and it’s easy and delightful to use. Flickr has so many things right. The whole way the site works is clever, thought through, and useful. But times are changing and so there is still much that Flickr needs to catch up on. But I love that it’s making serious strides forward, and that Yahoo is taking the service seriously. I’ve been a Flickr user for years and I use it now more than I ever have. It’s encouraging and exciting to see these improvements to their website, service, and mobile apps.